^ ا ب Totten, Samuel. Dictionary of Genocide. 2008, 298–299. ↑ MacDonald، David B. (December 2005). "Forgetting and Denying: Iris Chang, the Holocaust and the Challenge of Nanking". International Politics (Palgrave Macmillan) 42 (4): 403–27. doi:10.1057/palgrave.ip.8800111. http://www.palgrave-journals.com/ip/journal/v42/n4/full/8800111a.html۔ اخذ کردہ بتاریخ February 23, 2014. ↑ Fogel, Joshua A. 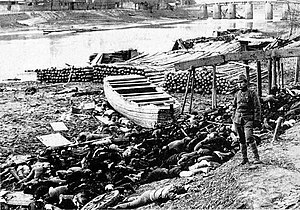 The Nanjing Massacre in History and Historiography. 2000, pp 46–48. ↑ Tokushi Kasahara, "数字いじりの不毛な論争は虐殺の実態解明を遠ざける", in 南京大虐殺否定論１３のウソ, ed. Research Committee on the Nanking Incident (Tokyo: Kashiwa Shobo, 1999), pp. 74–96. ^ ا ب Gallicchio, Marc S. The Unpredictability of the Past. 2007, p. 158. ↑ "I'm Sorry?". NewsHour with Jim Lehrer. December 1, 1998. Archived from the original on February 22, 2008. https://web.archive.org/web/20080222005155/http://www.pbs.org/newshour/bb/asia/july-dec98/china_12-1.html.